Sofa to 5k is a great way to get started with your running. We can help you get from where you are today, to a level of fitness which would enable you to run 5k (3.1 miles). No matter how fit or un-fit you feel today, you can soon start to make big positive changes to your health, weight, fitness and quality of life. 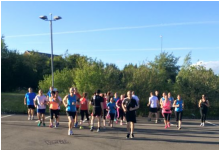 Our Sofa to 5k attracts all sorts of abilities, from beginners who literally can't run 100 yards when they start, to "rusty runners" who just need a structured way to get back into it. Most runners who complete our Sofa to 5k training go on to join our regular 5k sessions (on Tues & Thurs) and our 10k+ sessions (on Wed & Sun). Some even go on to run half marathons. We can help you achieve your own personal goals, but more importantly, if you run regularly you'll start to feel fit and active again, which can have a huge positive effect on your everyday life. You're more than welcome to join us, so why not pop along, we'll look forward to meeting you soon. What clothes / gear do I need? How do I join Sofa to 5k?